Somehow, almost all of us screwed up and missed "Bringing Out the Dead" when it was in the theaters, which is amazing. After all, we're talkin' the great Martin Scorsese directing the great Nicolas Cage. We're talking an outstanding cast that also includes Tom Sizemore, John Goodman, Ving Rhames and Patricia Arquette. But, I missed "Bringing Out the Dead" when it was in the big houses, and judging from the box-office figures, almost everyone else missed it, too. Costing $32 million, it only grossed a little over $16 million in U.S. theaters, which is shameful, and I am doing my share of hanging my head. But, we all have a chance to redeem ourselves, now that this excellent, powerful, beautifully crafted film is out on DVD and VHS. Rent it or buy it and see it soon. Let's see if we can atone for our slighting of the film when it was in the theaters. "Bringing Out the Dead is the story of Frank Pierce, a graveyard-shift ambulance driver who has gone too long without saving someone's life. It's great when he saves a life, he says. He walks on air for weeks afterward. But on his shift, in that part of New York City, the patients all seem in a headlong rush to destroy themselves, and having their lives saved by a heartsick paramedic isn't necessarily on their agendas. Noel, for instance, nicely played by Marc Anthony, who is a regular customer of the emergency room. Every night he is there, tied to a gurney, screaming for the glass of water he can't be given (the doctors think he has some condition that would be exacerbated by water). So, every night, just before he can get the treatment in the busy E.R. that might help him, he breaks free and runs off into the night again. 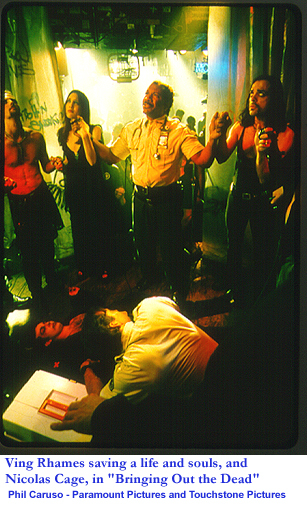 Or Mr. Burke (Collen O. Johnson), who is successfully resuscitated by Frank at the scene, which is where Frank meets Mary Burke, the dying man's daughter, played by Arquette. Frank gets Burke to the hospital alive all right, but once there Burke's heart keeps stopping, and the doctors keep shocking him back to life. Frank likes Mary, so over the next nights keeps visiting Burke. And although Burke is intubated, so can't speak, Frank thinks he hears Burke pleading to be allowed to die. Frank has already been having a hard time of it -- a while back a young woman with asthma died on the street after Frank was unable to intubate her properly -- and haunted by guilt over that, he keeps seeing her face on the scrawny, scraggly wretches he sees on the street every night in Hell's Kitchen. "Why'd you kill me, Frank?" she keeps asking. So, when Burke starts looking him in the eye and beaming thoughts to him ... Frank has gotta be having his own Hamlet moments, wondering whether he should help Burke die, or check himself in for a vacation at the nearest mental-health spa. As if he would be allowed any time off to get his brain back in order. He can't get any time off, he can't quit, he can't get fired. There just aren't enough medics to go around as it is. Instead, slipping unsteadily on the razor's edge of sanity, he is sent out night after night into New York's grittiest, meanest streets, to try to save the unsavable. This film is Scorsese at his most powerful, which is to say, filmmaking at its most powerful. The images capture the eye, convince the mind and touch the heart. Working from a brilliant script by Paul Schrader, based on the novel by paramedic Joe Connelly, Scorsese grabs us in his powerful hands and wrings us out like sodden laundry. And at the end -- after Scorsese finally releases us, and we drop, exhausted, into our TV-watching chairs -- we are left with gladdened hearts, because Frank does, after all, take arms against his sea of troubles, and by opposing, ends them. It's not a convenient, Formula Hollywood ending; it is one that can be respected. This may be the greatest performance of Cage's career. Cowering in the cab of his ambulance, beaten down by the apparitions of the asthmatic he couldn't save, he is a dog who has been whipped too much. Yet, his own humanity, his own decency and desire to help others -- including the drug-abusing Mary he meets and cares for -- is what ultimately saves him. Cage tells that story with a power unmatched by any other performance of his I have seen, and by dang few performances by anyone else I have ever seen. Goodman is good to watch, as always, and invests his ambulance-driver character with dimension and subtlety. Sizemore, as another driver, offers one of the best performances of his outstanding career. And Rhames is an absolute delight as the third driver partner Cage has, swilling whiskey and shouting "Hallelujah!" as a Bible-thumping evangelist. He carries the movie's best and funniest black-humor scene with brilliance. Oh. By the way: The soundtrack is great. Lots of fine blues and R&B. Martin Scorsese is one of my favorite directors. He knows the streets of New York City like nobody else. Whereas Woody Allen is uptown Manhattan, Scorsese is the lower Bronx. He can take murderers and junkies and make them compelling. 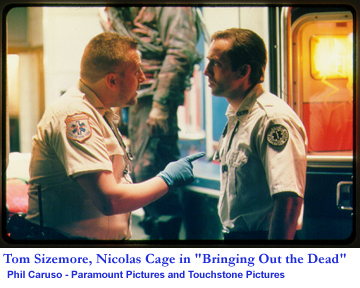 "Bringing Out the Dead" is about a burned-out New York EMS technician named Frank (Nicholas Cage), who during the course of a hot, humid weekend, hopes to save a life and somehow find redemption from the ghosts that haunt him, particularly one named Rose, a street urchin who died while under his care. 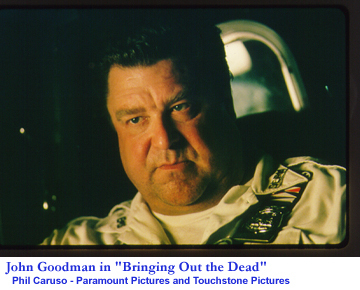 During the first night, he and his larger-than-life partner (John Goodman) haul in a coronary patient barely clinging to life. Frank finds himself drawn to the estranged daughter (Patricia Arquette) of the dying man, an oddly vulnerable woman with many complex layers. As the weekend progresses, Frank encounters junkies, drunks, gang bangers, victims, drug dealers, prdeators and criminals of all sorts. Frank longs to be put out of his misery and tries his very best to get fired, turning to alcohol as the only way to ease his pain. Over the course of the weekend, he rides with a variety of partners, including the Bible-thumping ladykiller Marcus (Ving Rhames) and on the final night, his psychotic ex-partner (Tom Sizemore). He drifts through the flotsam and jetsam of humanity, struggling to avoid drowning himself. Scorsese's visual style carries the movie, using light and shadow to delineate Frank's fall from grace and eventual return to the light. Nobody uses motion and color like Scorsese, and he uses it well here. Unfortunately, Paul Schrader's script (Schrader and Scorsese previously collaborated on "Taxi Driver") is scattershot, ill-plotted and occasionally pointless. I suppose the story is meant to reflect the pointlessness of life in the underbelly of a city where death and despair are constant companions. However, exorcising our demons is not just a matter of forgiveness; it requires faith and good timing too. When Frank encounters Rose for the last time, I found myself screaming at the screen "I get it, I get it already!!!!!!" Frank looks at the world through desperate eyes, seeking some kind of miracle in the muck. That he finds saintliness amid the squalor is a testament to his faith. That I watched the movie to its conclusion is a testament of my faith in Scorsese. Sadly, my faith was unrewarded, and I have to tell you that if you need a fix of Scorsese, go rent "Casino," "Goodfellas" or "Taxi Driver" instead. 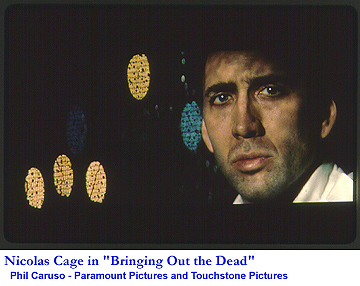 See cast, credit and other details about "Bringing Out the Dead" at Internet Movie Data Base.